I love versatile things, like a great cardigan, real vanilla ice cream, pita bread, and mason jars. These things can take on multiple functions and are a great base. That’s where today’s recipe fits in…a great base or launching point for many other recipes. Today’s featured recipe is the third recipe from the Food Matters Project, a group of food bloggers focused on cooking through the Food Matters Cookbook by Mark Bittman. 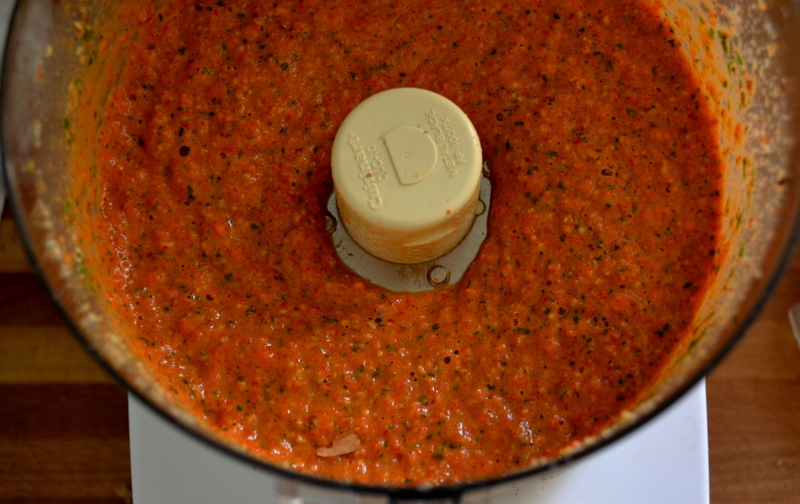 The original recipe, featured by Heather of girlichef, is Roasted Red Pepper and Walnut “Pesto”. The original recipe purees 8 roasted red peppers, walnuts, olive oil, and basil to form a pesto-like spread. I decided to do a variation and replace half of the roasted red peppers with cannelini beans and use almonds instead of walnuts (because that is what I had on hand). I wanted to move this recipe more towards hummus and add a kick with red pepper flakes. 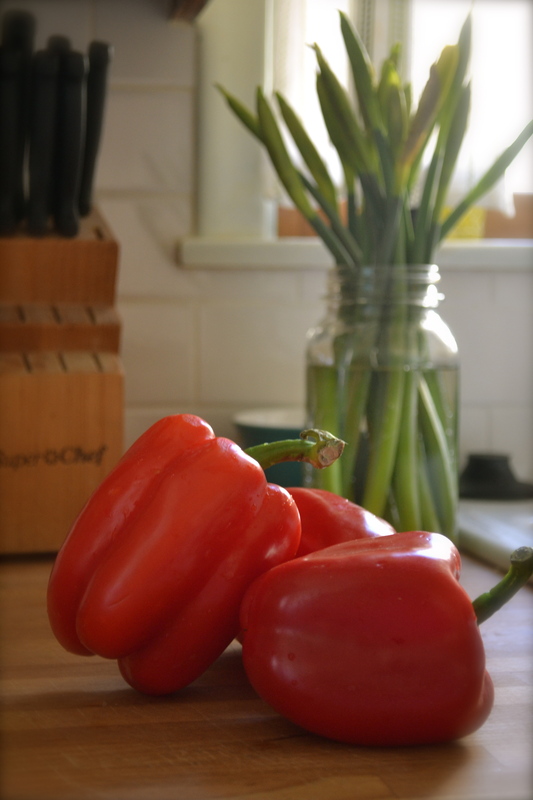 The red pepper flakes help balance out the sweetness that occurs from the red peppers. I think the quantity of red peppers is a little much and could be reduced to two peppers. This spread ends up being like the little black dress of condiments. I used it as a sandwich spread to amp up my veggie sandwich. And because this recipe makes quite a large batch, I had enough left to use as a pesto-like base to a pasta dish with roasted tomatoes, goat cheese, and extra basil (sorry no pictures of that awesomeness). 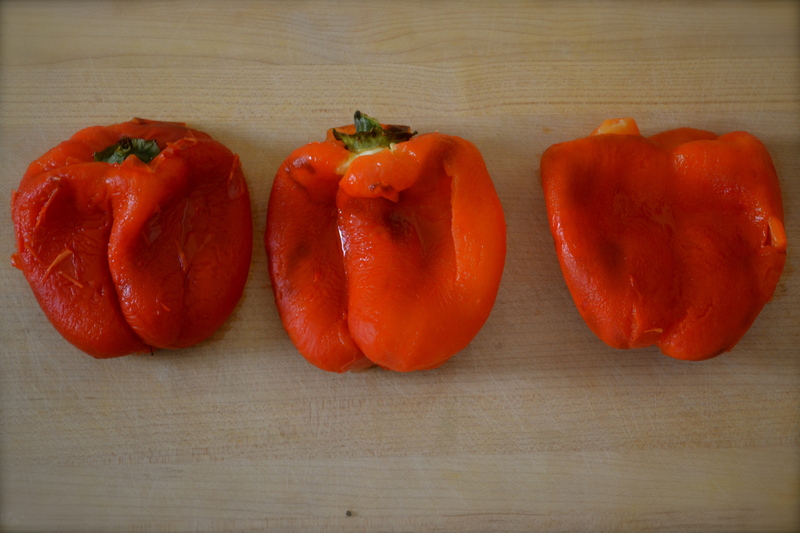 The primary component of this recipe is roasted red peppers. 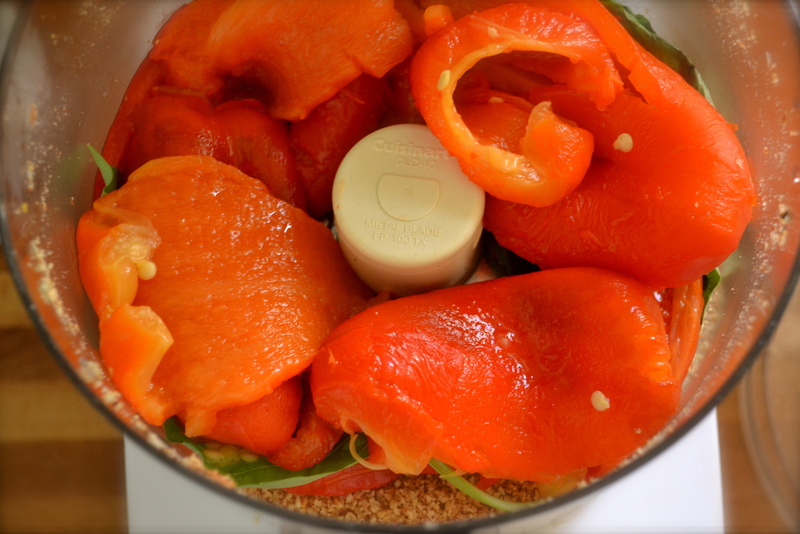 You can use jarred roasted red peppers, but it is also really easy to roast your own. 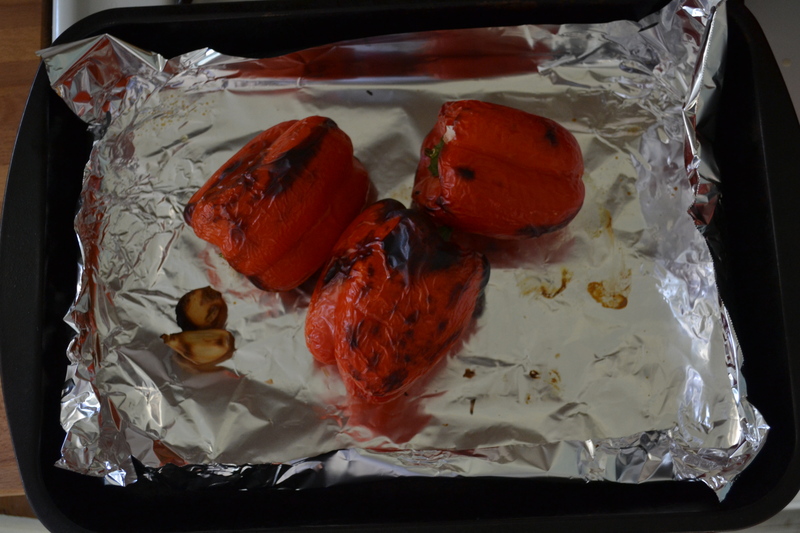 Simply place them red peppers (whole) on a foil lined roasting pan. Turn your broiler on high or heat your oven to 450F. If using the broiler, the processes will only take about 15 minutes, but make sure your turn the peppers every 4 to 5 minutes, browning on all sides (see picture below). If you decide just to roast them in an oven preheated to 450F, this process will take about 45 minutes. After the skin is slightly charred, wrap in the aluminum foil from the pan and allow to sweat and cool. Unwrap after at least 10 minutes or until cooled off. Run the peppers under cold water and peel the skin off of the peppers. Remove the tops and deseed. And voila, you have roasted red peppers! 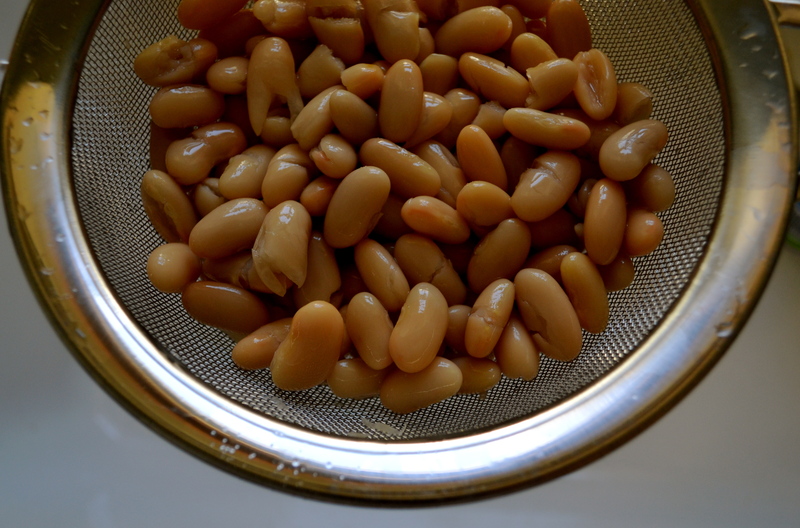 These are good on pizza, sandwiches, hummus, pasta dishes, and so much more! If you are intested in other variations on the FMP recipe, check the main website here. Note: I liked this spread on sandwiches and as a dip for pita chips. It also works well tossed onto fettucini with some goat cheese and roasted tomatoes. The possibilities are pretty limitless. Roast red peppers as described above or use jarred roasted red peppers. Place garlic in food processor and pulse. Add almonds and pulse until a fine meal is formed. Add beans, basil, red peppers and puree. Drizzle olive oil and lemon juice into the puree. Pulse the food processor until all is combined. Add salt and red pepper flakes to taste. 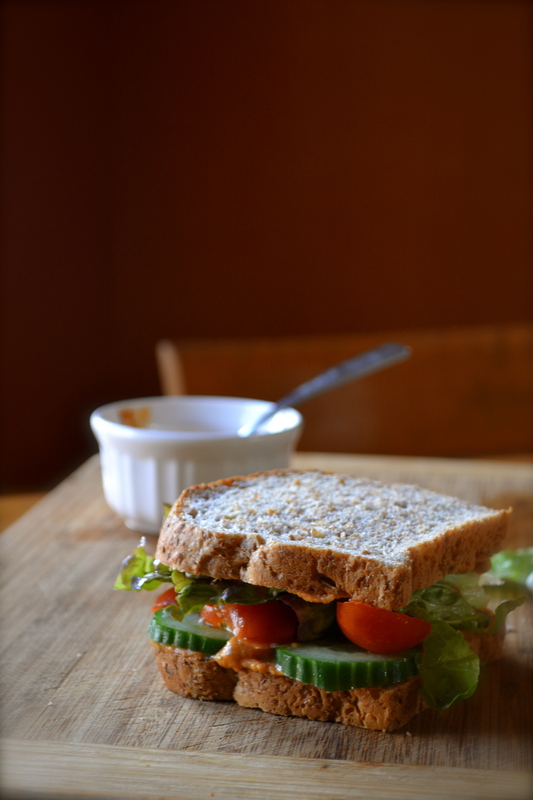 I love the idea of using the pesto with cannelinis as a sandwich spread…oh the possibilities! I think this will easily become a staple at my house, especially in the summer with garden fresh peppers. I also used almonds and was so happy with the outcome. 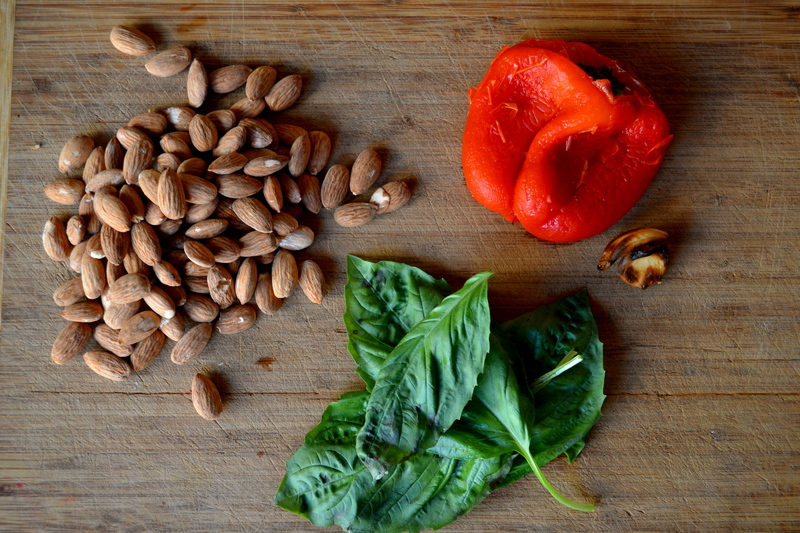 Love this challenge – I don’t think I would have made an almond pesto without it! I agree. But was your pesto sweet? The red peppers + almonds seemed a bit on the sweet side, which is why I decided to add red pepper flakes. I might also add smoked paprika to tone down the sweetness. Not at all. But I added olives, basil, parsley and smoked paprika. Also, I used jarred peppers from Trader Joe’s and they are “fire roasted” and not as sweet. Yep! My obsession with white beans continues as well. Loved this one, too! Looks like we both made mega delicious sandwiches! One of my favorite things about this recipe is how versatile it is. SO GOOD. Yum! I’m craving it now. What did you think about the pecans? I almost used pecans too, but went with almonds instead. I like that you omitted the oil. I used 1 tablespoon. I personally think 1/2 cup was way too much. Hi Alissa, Your pictures are fantastic. I used my leftover pesto on a sandwich today and it was great. Thanks for the inspiration. Thanks. I love it on sandwich. Your pesto pizza is a great idea. I’ll have to try that with my leftover spread. Adding some lemon definitely makes this a lot better. I took a couple of tablespoons and tested what it would be like with some lime and I loved it! I’m so glad to have this easy pesto in my repertoire, too! I added red pepper flakes to mine and I’ll add a squeeze of lemon juice tomorrow. Citrus makes everything better! Now that, is a sandwich! 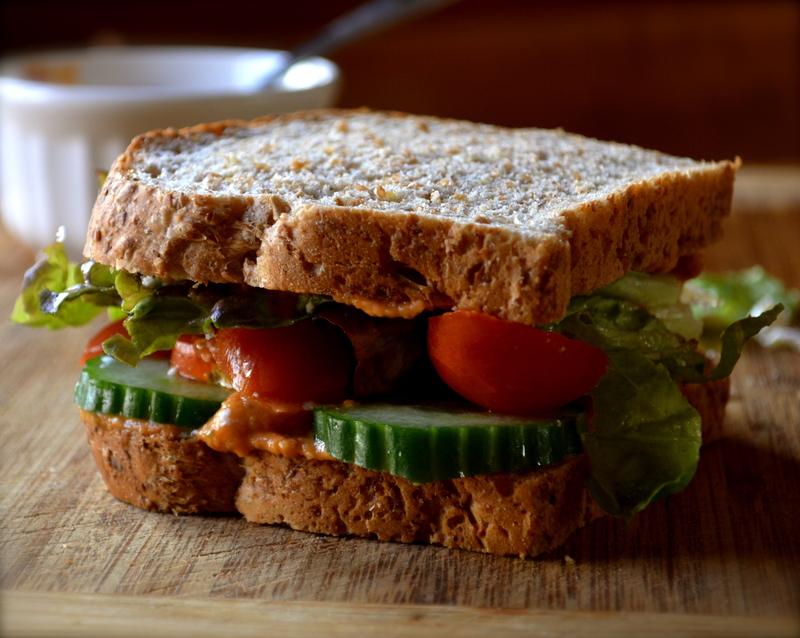 I love it—green, red, spread, and whole wheat…yes! 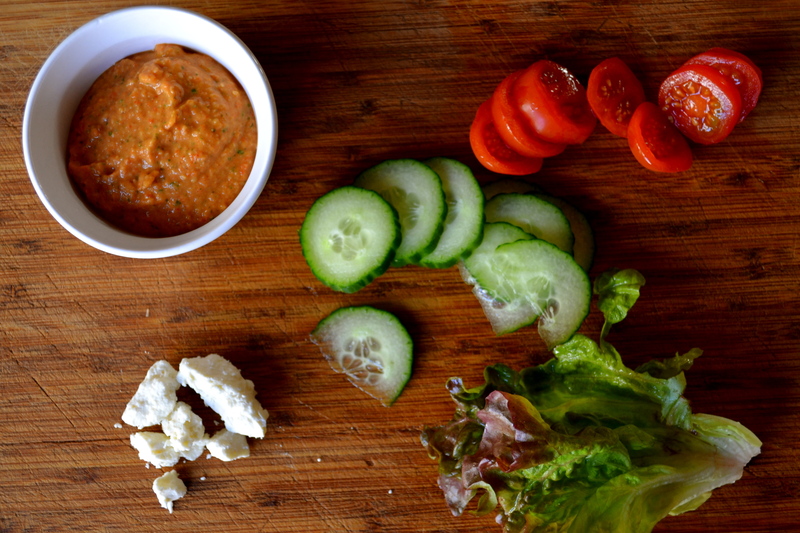 This spread AND your sandwich look incredible – can’t wait to try it!